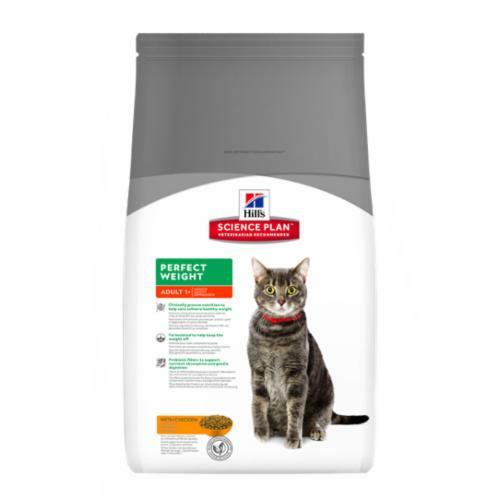 Hills Science Plan Feline Adult Perfect Weight is a finely balanced cat food that provides complete nutrition whilst helping your feline friend achieve and maintain a healthy weight for a longer, happier life. Also suitable for sterilised cats. This clinically proven food is expertly formulated to help cats lose weight and keep it off, with added prebiotic fibre to help increase nutrient absorption whilst being gently on the digestive system. Chicken (23%) and turkey meal, brewers' rice, maize gluten meal, cellulose, tomato pomace, dried beet pulp, flaxseed, animal fat, coconut oil, digest, minerals, L-lysine, DL-methionine, dehydrated carrots, L-carnitine, vitamins, taurine, trace elements and beta-carotene. With a natural antioxidant (mixed tocopherols). Protein 39.8%, Fat content 13.4%, Carbohydrate (NFE) 31%, Moisture - , Omega-3 fatty acids 1.09%, Omega-6 fatty acids 2.47%, Fibre (crude) 9.4%, Calcium 0.97%, Phosphorus 0.73%, Sodium 0.4%, otassium 0.75%, Magnesium 0.09%; per kg: Vitamin E 688mg, Vitamin C 111mg, Beta-carotene 1.6mg, Taurine 2,021mg, L - lysin 2.21%, L-Carnitine 545mg.